This topic provides information about creating asymmetric keys. If you want to create symmetric keys, see the Creating Keys and Key Rings topic. A key ring is defined by its location and name. 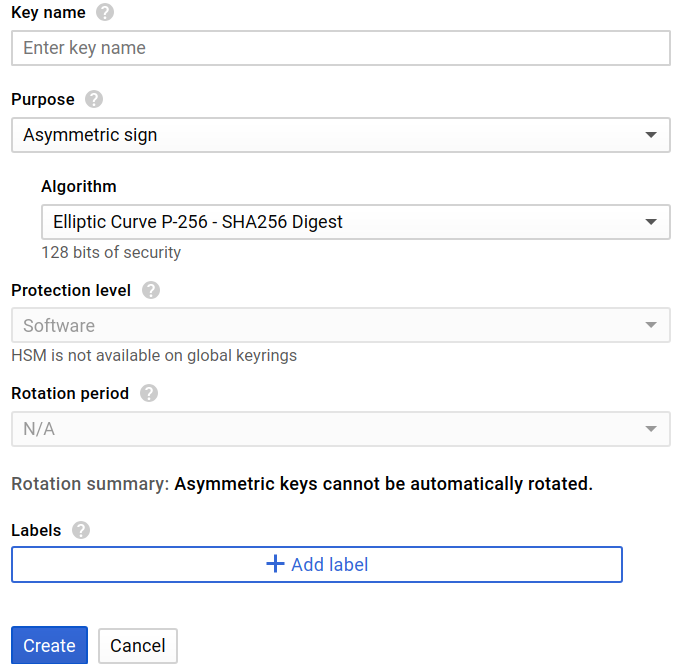 Go to the Cryptographic Keys page in the GCP Console. In the Key ring name field, enter the name for your key ring. From the Location dropdown, select a location. Create a new key ring with name [KEYRING_NAME] in location [LOCATION]. Create a key ring by calling the KeyRing.create method. A key must be created in a key ring. Click the name of the key ring for which you will create a key. In the Key name field, enter the name for your key. Click the Purpose dropdown. Select an asymmetric key purpose, for example Asymmetric sign or Asymmetric decrypt. To learn more about key purposes, see Key purposes. Click the Algorithm dropdown. Select the algorithm for your key. You can change this for future key versions. The choice of Purpose determines which algorithms are available. For example, if your key purpose is Asymmetric sign, one of the supported algorithms is Elliptic Curve P-256 - SHA256 Digest. To learn more about algorithms for an asymmetric key, see Key purposes and algorithms. For Protection level, select either Software or HSM. To learn more about protection levels, see Protection levels. [Optional] In the Labels field, click Add label if you want to add labels to your key. Create a new key [KEY_NAME] for the key ring [KEYRING_NAME]. Set --purpose to asymmetric-signing or asymmetric-encryption. For the list of values supported for --purpose, see --purpose. To learn more about key purposes in general, see Key purposes. Set --default-algorithm to the algorithm you want to use. You can change this for future key versions. The choice of key purpose determines which algorithms are supported. For example, if your key purpose is asymmetric- signing, one of the supported algorithms is ec-sign-p256-sha256. For the list of values supported for --default-algorithm, see --default- algorithm. To learn more about algorithms for a key, see Key purposes and algorithms. Set --protection-level to either software or hsm. You can learn more about protection levels in Protection levels. Create an asymmetric key by calling the CryptoKey.create method. Specify a key purpose of ASYMMETRIC_SIGN or ASYMMETRIC_DECRYPT using the CryptoKeyPurpose type. To learn more about key purposes, see Key purposes. Specify an algorithm using the CryptoKeyVersionAlgorithm type. You can changes this for future versions. The choice of key purpose determines which algorithms are supported. For example, if your key purpose is ASYMMETRIC_SIGN, one of the supported algorithms is EC_SIGN_P256_SHA256. To learn more about algorithms for a key, see Key purposes and algorithms. Specify a protection level of either software or HSM using the ProtectionLevel type. When you create an asymmetric key, the initial state for the key version is pending generation. When Cloud KMS finishes generating the key version, its state automatically changes to enabled. Learn more about key version states at Key states. If you want to retrieve the public key portion of the newly created key version, follow the instructions at Retrieving a public key. A signer or validator requires the appropriate permission or role on the asymmetric key. For a user or service that will perform signing, grant the cloudkms.cryptoKeyVersions.useToSign permission on the asymmetric key. For a user or service that will retrieve the public key, grant the cloudkms.cryptoKeyVersions.viewPublicKey on the asymmetric key. The public key is required for signature validation. Learn about permissions and roles in Cloud KMS release at Permissions and Roles. Learn about Creating and validating signatures. Learn about Encrypting and decrypting data with an RSA key. Learn about Retrieving a public key.